The Megaminx Is the most complicated Magic Polyhedron in production. If you liked the Pyraminx the Magic Cube, or the Magic Jewel, you’ll love this challenging Dodecahedron puzzle. 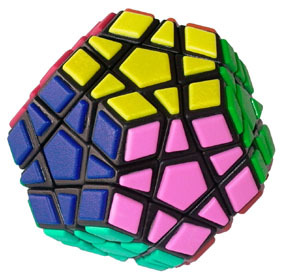 The Megaminx allows you to rotate its corners and mid-edges around twelve stationary mid-faces. It has precision injection molded parts which make operation easy and exact. The idea of the puzzle is to scramble the colors and then return them to the initial state of twelve single-colored sides. There are 1.2288x10^64 possible positions of the Megaminx. Fortunately the Megaminx is not impossible when it is broken down into smaller problems. Just in case you do have difficulty in solving the Megaminx, a solution booklet is included with the puzzle. A really good present for the "Puzzle Know-it-all"!